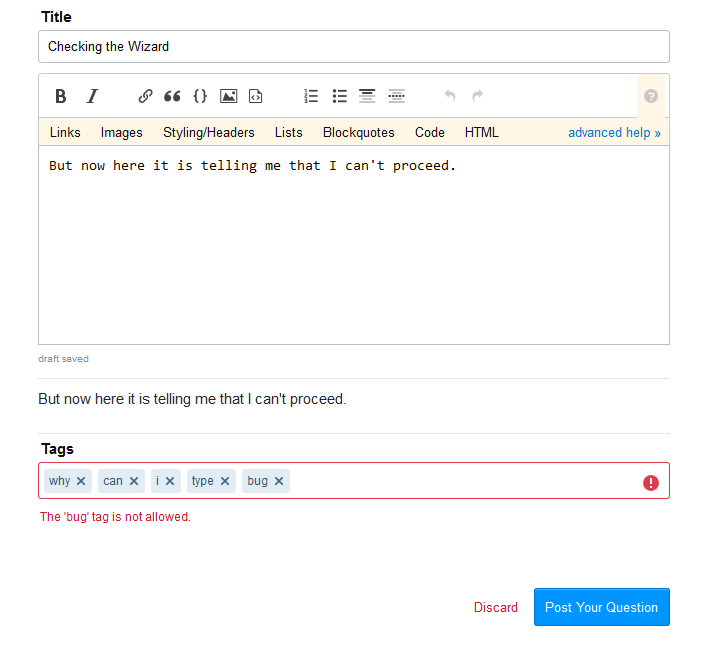 I'm really happy to announce that the Ask Question Wizard is now live on Stack Overflow! This is the end of a long arc of experiments that have been happening for over a year to provide structured guidance to newcomers when asking a question, and I'm so excited for everyone in the community to give it a go. 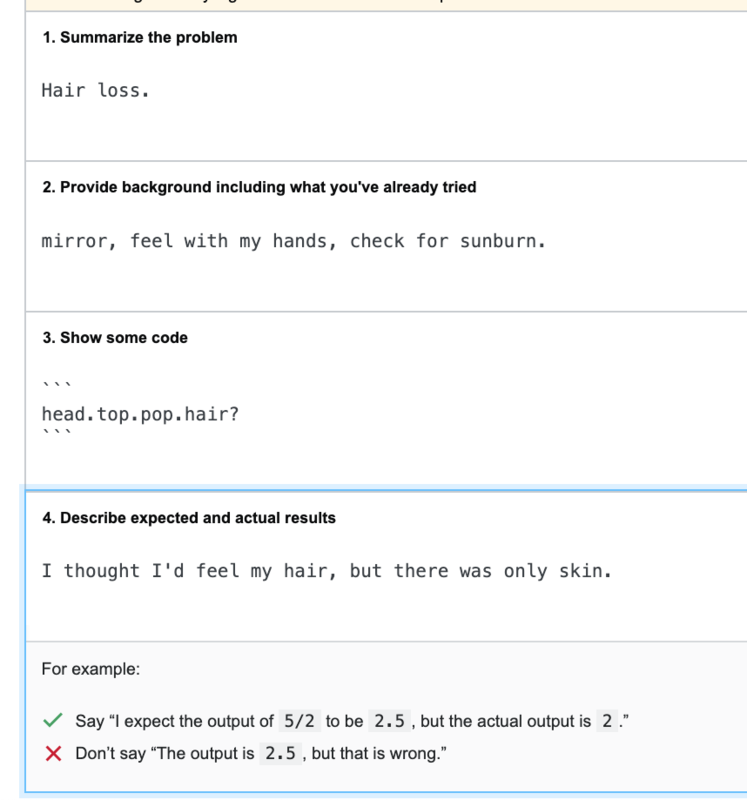 This is the biggest change we've made to the question asking experience on Stack Overflow since we started a little over ten years ago, and it's the result of a lot of hard work and collaboration with all of you in the community. Go to the question asking page. If you are under the reputation threshold (currently 111, because that's what we tested with in previous experiments), you will automatically be directed to the wizard, also known as guided mode. If you are over that threshold, you'll be taken to the original question asking page, which we're calling traditional mode. You can switch from traditional to guided mode at any time by clicking the "Use guided mode" link near the top. When in guided mode, you'll be able to switch to traditional mode after first answering a few questions - a "Use traditional mode" link will appear when this is available. After you've switched modes, future visits to the question asking page will direct you to the question asking mode you last used for a period of time, overriding the default described in #1. That way, you don't need to keep switching back and forth between the two experiences. After that time period expires, you'll again be directed to the default mode based on your reputation. Switching between guided and traditional modes should always save your work once you start typing your question, so don't worry about losing any drafts when switching between the two modes. There might be slight differences in formatting when you switch, but the content of your post should always be preserved. Guided mode addresses many of the concerns newcomers have about asking their first few questions. There is a lot of guidance, history, and culture involved in asking a question, and filling out those few blank boxes in the original question asking page can feel like a daunting task. With guided mode, we've tried our best to bake in many of the best practices when asking a good question on Stack Overflow. We're hoping that, with this launch, asking a question can turn from an intimidating experience into one that is more approachable and even fun. Guided mode means better questions on the site overall. Based on our experiments, we found that question quality improved when using guided mode compared to traditional mode. In our latest experiment, we found a 5.12% decrease in bad-quality questions, and a positive change in neutral-quality questions (2.26% increase) and good-quality questions (1.12% increase). We also saw an overall 3.42% decrease in overall question volume, which correlates pretty well with the decrease we saw in bad quality questions. These early findings suggest that we're not only helping people ask better questions, but also stemming lower quality questions that occur on the site. These may seem like small percentages, but when we consider the scale that we're operating at with this launch, these small differences can have a large impact that we'll be looking for over the long term. One of the biggest wins with this launch is that we now have a framework for improving the question-asking experience. We wanted to get this first public version of guided mode out so we can continue improving on it as we learn more about how it's used. 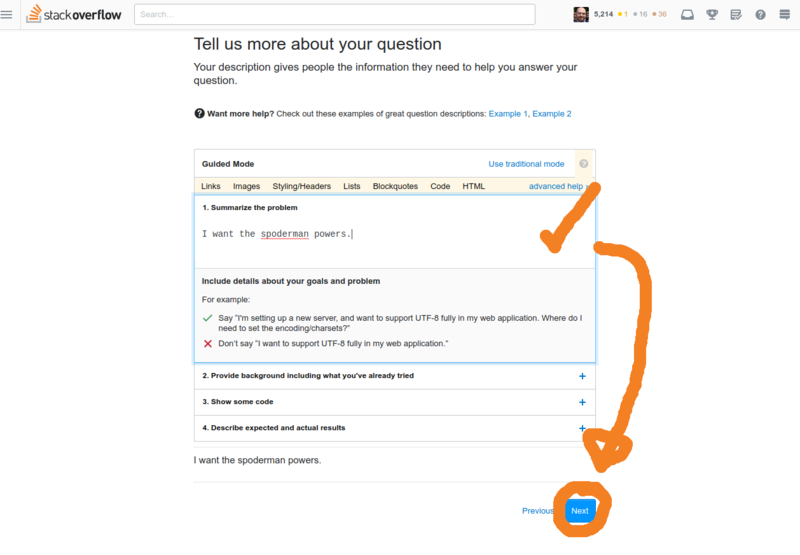 The team at Stack Overflow has a lot of exciting ideas about how we can improve the question-asking experience with this in place, but we also want to hear from you! Go and try out the wizard, and tell us what you think could be improved and what new ideas you're excited for us to explore. You'll be hearing more from me and the rest of the team in coming weeks about the wizard and other features that are coming soon. 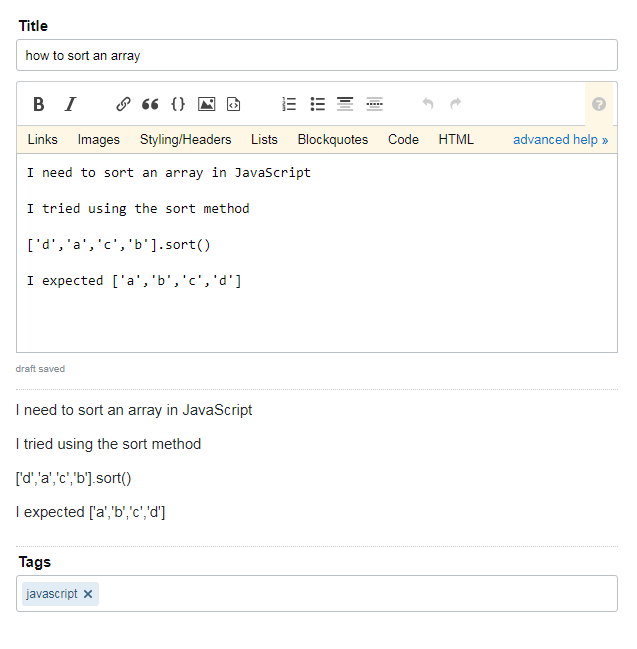 We think this is one of the first big steps we can take to help both newcomers and veterans of the site collaborate better on Stack Overflow. I expected hitting Next after filling in Summarize the problem would put me in the Provide background including what you've already tried and instead it brings me to review. This seems like an easy mistake to make. The Do any of these answer your question? still appears when the search for similar questions returns 0 results, and asks you to verify that none of these 0 similar questions answer your question. This issue has already been raised in this answer when the prototype was just ready, and apparently is status-planned there. The guidance currently highlights the importance of code formatting (which is great! ), but fails to note the importance of creating a Minimal, Complete, Verifiable example. Although the bold text ('Share as little code as possible that still reproduces the same problem') starts to hint towards this, a new user would most likely interpret this as 'copy-paste the only section of my code that has a problem' - which is not correct, as such a sample would be neither complete nor verifiable. Additionally, I found that my eyes skimmed over the bold section, straight to the examples - it was only when I purposefully searched for a link to MCVE that I fully read the sentence. An ideal solution would be to add another 'good' example, saying something like '<tick> Create a minimal, complete, and verifiable example', and linking to the relevant help page. The wizard shakes violently when loaded in Internet Explorer 11. This makes the wizard completely unusable in that browser and can cause accessibility issues with users with photosensitive epilepsy. It seems that it cannot decide what the right width is, for responsive design. I did discover that reducing the width of the browser window works around the issue and makes it remain still. "What type of question do you have?" has a number of gotcha selections to short circuit off topic questions. I'd suggest adding "I have a question about this website" and redirect them here. You can't navigate (back button) backwards through the wizard, and some courses of action don't have a previous button, such as choosing "Other" for type of question. There's a possibility if you go down one route and wish to go down another you have to start over from the beginning. Not what I'd expect. I'd expect the back button to work or for the previous button to be everywhere. I still think asking for a title at the end is a better option than before writing the question, but placing the tags first is very good. When showing the user questions that might already have my answer, don't show unanswered questions or questions that are downvoted. Sort by votes and pick the top 5. If you show fifteen hundred in random order like you're currently doing nobody's going to want to slog through that. Probably won't even bother checking one, I know I didn't feel like it. Each step in the wizard has such a small initial edit size. I'd prefer a larger initial area, with a well defined bottom barrier that can be adjusted manually (as in the regular post box). Also, automatically collapsing previous sections when moving on will help save on scrollwheels. 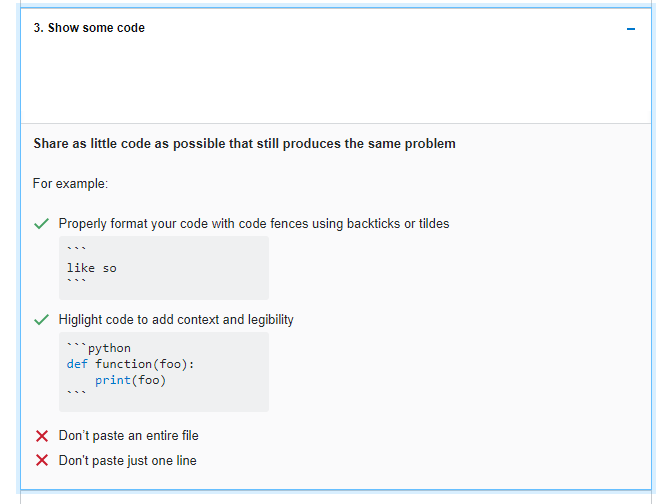 If I don't put code blocks in the code section, consider this an error condition and prompt the user to format their code if they have not done so. In the expected results section, prompt the user to add the full text of any error messages they were given. I think overall you guys did a pretty good job on this, from what I've seen. Congrats. If I indicate that "I need to troubleshoot some software or hardware", the wizard assumes that I'm about to ask an off-topic question and attempts to redirect me to a more appropriate place (Super User). That works well in most cases, and I appreciate the motivation behind it, but there is a very important exception. Per the Help Center, one of the topics that can be asked about on Stack Overflow includes "software tools commonly used by programmers". Practically speaking, that means questions about configuring your IDE, setting up a debugger, rebasing with Git, exiting Vim, and so on are allowed here. They might also be allowed on Super User, but that doesn't make them off-topic for Stack Overflow. Standing policy is that the asker should be allowed to choose where she wants to ask her question if it is on-topic for multiple sites. That decision is commonly based on where the asker thinks she will get the best answer, and in the case of programming tools, the best answer will almost certainly come from Stack Overflow. You might say this is really not a big deal—why do we care if we redirect new askers to Super User?—but I disagree. There is plenty of confusion, even among long-time members, about whether questions about programming software tools are on topic. They absolutely are, and we need to be careful not to do anything that reinforces perceptions to the contrary. Implementing this in a way that maintains the simplicity of the wizard is somewhat challenging, and I'd be open to suggestions about the best approach. I don't think it makes sense to add another option button to the starting page of the wizard. It would look too similar to the existing ones, and too many options is actually a bad thing. So, I think we're going to have to modify/expand the existing option. Maybe an interstitial step can be added that asks, "Is your question about software tools used primarily by programmers?" You can give an example or two (Visual Studio, Xcode, Git, Vim, etc.) in the body section. If the user clicks "Yes", they get routed to ask on Stack Overflow. If they click "No", they get routed to ask on Super User. This would also allow later expansions to, "Is your question about professional server or networking administration? ", and routing to Server Fault. And other adjustments deemed necessary when the Super User folks start coming at us with pitchforks. I find this phrasing unnecessarily weak and giving a false impression to pure help vampires. The tip suggests that asking a proper question “only” improves the quality and speed of answers. It fails to mention that not adhering to this is extremely frowned upon, unethical, and will (or at least should) yield no answers whatsoever. Also, “homework questions” is bound to be naïvely interpreted as referring to the homework task itself, which is exactly what we do not (directly) want to help with. 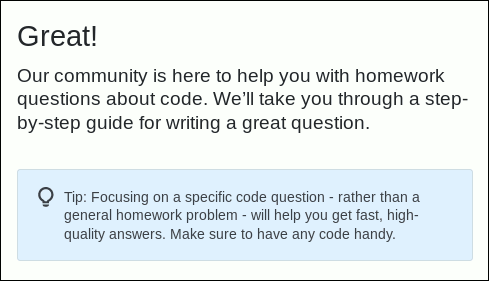 Our community is here to help you with coding questions about your homework. We’ll take you through a step-by-step guide for writing a great question. Tip: We will not do your entire homework for you, only help you with it. Show us your code and focus on a specific problem you're having. Tell us what you already understood and where you are struggling. bug - Typo in the "Show some code" help text of the description step. The <title> tag in the HTML is empty as I click through the wizard, which means that I get the raw URL appearing in my browser's title bar. The title seems to be in place when I first open the page, but as I navigate through it, the <title> tag's contents somehow get cleared. It might be nice to have the <title> dynamically update to reflect which step of the wizard I'm currently on, but that's a whole lot less important than just making sure that the page has a proper title. Keeping the original "Ask a Question - Stack Overflow" visible at all times would be acceptable. Finally, we got tags before title. Can the search also be modified to include the tags in the "There may be similar questions"? At present, even with guided mode, I still feel the similar questions list to be less than ideal. 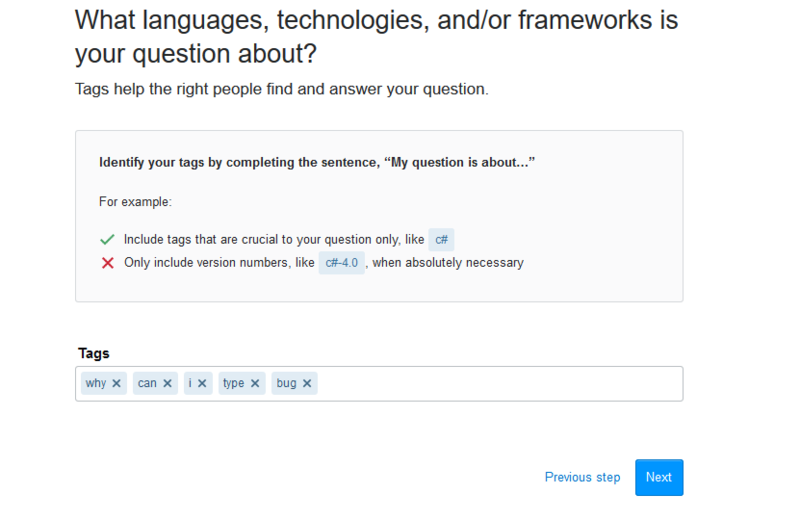 Include the chosen tags in the search criteria for "Questions that may already have your answer." I think that this is planned since I ask about it all the time, but just as a reminder :) please include the tags in the search. Beyond that... so excited. This seems like a really beneficial tool for so many new users. I hope it pans out, and will take any amount of improvement. That said, there is a lot of potential here, even small percents will be large progress. feature-request Track the impact on the other sites redirected to by wizard. Since wizard redirects askers to some other Stack Exchange sites I would suggest to somehow track how this works, in order to make sure that we understand the impact. Staying oblivious of this impact carries a risk that affected sites may eventually push for their removal from wizard targets as was discussed eg here. Ideally we would want to know how many askers registered at the target site, how many of them asked a question and how well this question went. But for a start, we could at least track amount of clicks from wizard to other sites (possibly sampled), similarly to how it is done for hot questions at sidebar. When users who are logged out attempt to follow the link to the wizard, they receive a 404 error. The wizard link only seems to work for users signed into an account. I understand that Stack Overflow (unlike most other SE sites) doesn't allow anonymous users to ask questions, but the normal "Ask" page shows a nice error message indicating that the user must be logged in. However, the Wizard link shows a 404 error, which has caused users to get confused. Can we please make the Wizard link also show the same nice error, indicating that the user must be logged in? 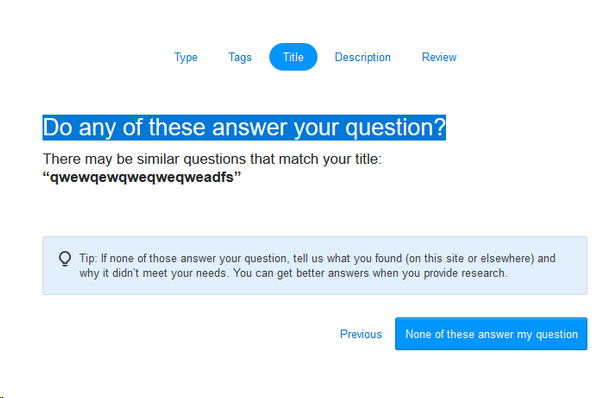 It's easy to leapfrog the Tags, Title, and Description tabs and head straight to the Review tab without entering anything on them, with the big, blue Post Your Question button enabled. Leaving any of these fields blank prevents the question from being submitted and raises errors to the user, but why even show this page until they've successfully completed the first three tabs? If the goal is to "provide structured guidance to newcomers", then force them to do the first parts of the wizard, and only bring them to the review when they've done so. As it stand now, it's easily avoided. I think that telling the users to not worry can be setting them up for failure. "And don’t worry—you can edit your question after it’s posted, too." Then I am concerned that the user will have a rough go of things. Including the nod towards editing is good, but instead of "Don't worry", there should be a warning that voting and actions will be immediate and will be reflective of the post in its current shape, perhaps also including that asking a question at Stack Overflow expects a good amount of research to have been done up front, since at this point most of the basic questions have been asked. 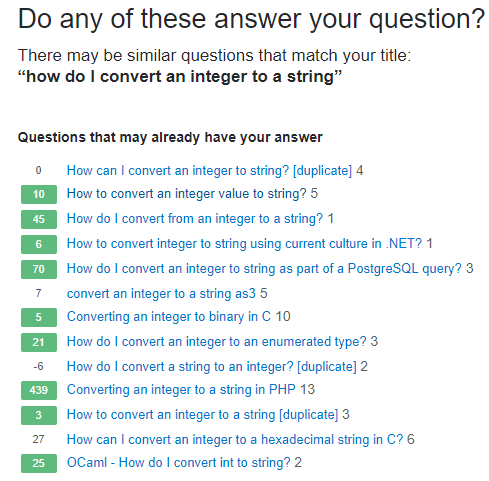 I put in the python tag, and then asked the question "how do I convert an integer to a string". The top non-duplicate answer was for Java. I would expect the tag I entered be used to filter the other possible answers. Ask a question tagged regex. Go through the entire wizard. 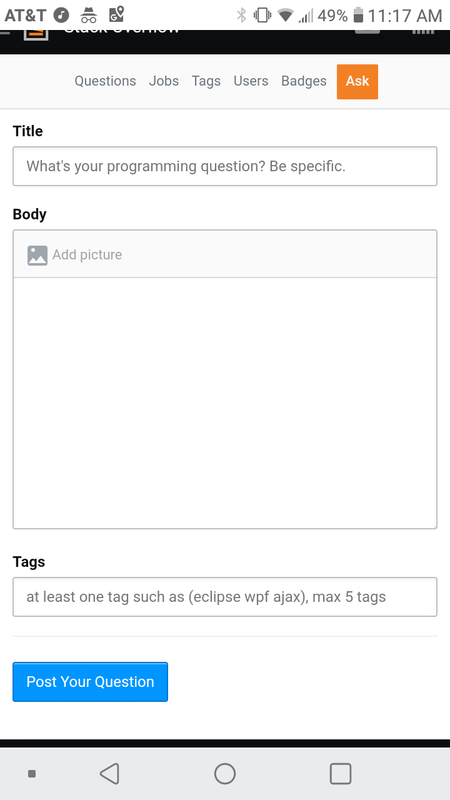 Advice about other or more specific tags is best given on the tag page. Reminders what questions are completely off-topic is also best given on the tag page or shortly afterwards (see the tag warning for seo for an example). Some advice is obsolete as the wizard already incorporates it by default, e.g., as “show some code” or “describe expected and actual results”. Some advice should be given before the question is fleshed out, e.g., the advice about including both, matching and non-matching examples in the above tag warning. Don’t show in question wizard. Then, show them according to their category in the wizard, and combine them in the traditional mode (like it is now). When you go to the "Review" page and click on "Discard", you should be redirected to the beginning of the guided tour. Currently, only all form fields are cleared but you stay on the current page. This is a very minor gripe, but there's currently no way to use the stack snippet generator thing. I'm not sure that new users would discover that feature anyways, but I certainly missed it when I was trying to test out the wizard. I've commented on this proposal at every iteration, and I guess I'll once again register my dissent, although it feels pointless now. While this feature has improved since last iteration, I still disagree with its existence. Most good questions on the site couldn't've been asked using Guided Mode. My posts are consistently well received, but I'm not sure if I've ever asked or answered a question that fit the 4-part structure guided mode asks for, and many of them couldn't possibly be contorted into it without damaging the question. I don't really care if we have statistics showing an improvement in question quality if that improvement amounts to making what would've been bad debugging questions merely mediocre. I want us to get thoughtfully-crafted, widely-applicable questions that provide value to future readers. Guided mode is at best an irrelevance to that goal. The only "good" thing it can do is help thoroughly incompetent askers - people who are here to get their broken code debugged and who cannot even manage to coherently and answerably ask for that help if presented with an empty text box - to post better-polished turds. For what? How does that make us a better library of knowledge? Why does anyone care? I guess my side has lost the debate; the comments and votes here make clear that the community seems to be enthusiastic about this feature. But I still want to say, one more time, to all of you: I think your enthusiasm is misguided. You will not get interesting questions that hold the attention of experts and produce value to future readers from this form. And, even with the option to swap to traditional mode, the signals about what questions are allowed here - like the form that only really supports debugging questions, or the instruction in the "Other" flow that only questions containing source code are acceptable - will drive away intelligent, conscientious contributors who would've asked thoughtful, broadly applicable questions if only we hadn't put up signs telling them that their contributions were unwelcome. Which is a loss for us. One thing that bothers me about the new wizard is that Stack Overflow was originally something of an attempt to collaboratively build an FAQ; the ideal was that people who had a question about programming wouldn't have to ask it on Stack Overflow, because the question would already be there, and the answer would already be there, thus there'd be no need to post a duplicate. 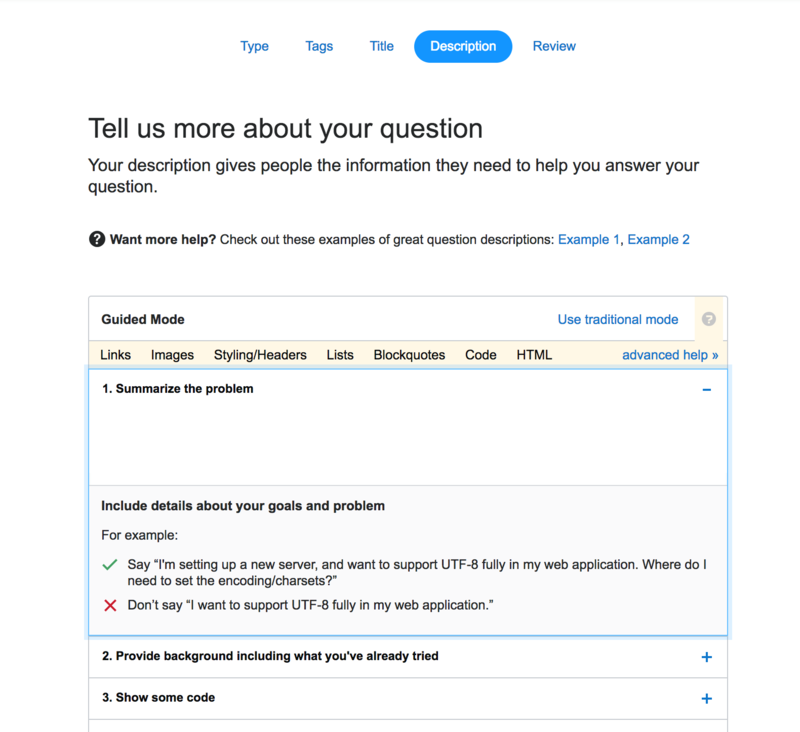 Their first step is to list their type of question, and they already get stuck: it's not a question about code, it's not a homework problem, it's not asking for a recommendation, it's not a troubleshooting issue. So they have to choose "Other". Now for the question to be appropriate to SO, it needs to "include a bit of code", "concern a specific coding issue, algorithm, or language", "not be opinion-based". The second and third categories definitely fit. The first doesn't. Is this an "and" or an "or"? The page doesn't use a conjunction. Treating it as an "and" quickly reaches a dead end (even though it looks like one! ), so let's assume our user decides to treat it as an "or" and continues asking on Stack Overflow. How many of these points fit? 1 sort-of, 2 and 4 very tenuously, 3 not at all. It's not possible to write this question using the template used by the new wizard, because it's a generic question describing a generic issue, and which gains as a result of that. The template is basically trying to force Stack questions posts to look like a "debug my code for me" or "help me finish my unfinished code" question. 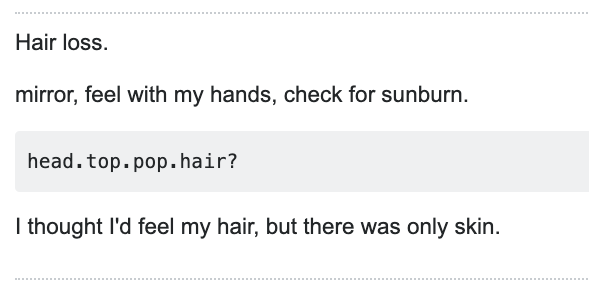 Now, it's pretty good at making those sorts of questions provide the information they need for people to solve them; but it's immediately repelling any other sort of question, including the fundamental questions that Stack Overflow derives most of its value from. Most frequently-asked-questions won't have a corresponding frequently-given-code-sample to go with them! The fix to this would probably be to add an extra path through the wizard, but I'm not immediately sure what it would look like or what sort of information it would need to aim for. There is still one aspect of this that is pretty unapproachable to new users. Why in the world is there no formatting toolbar? We get one in the normal asking/answering boxes, and it is much more user-friendly (though it still allows the exact same help that the guided mode does if you want to click the ? button and learn more. bug – The wizard is not correctly implemented on mobile. Click "Ask Question" on an account with less than 111 rep, or use the wizard link from this question (I tried both). The view will be changed to that of the full site, but the wizard will appear. Select "I have a question about some code" and click "next" twice. Instead of being taken to the next step in the wizard, the normal mobile traditional view appears, even though the URL is https://stackoverflow.com/questions/ask?guided=true&__=940538704 (Note the guided=true in the url). In order to return to the wizard, a mobile user must scroll down to the bottom of the page and request the full site. This could be considered a loophole for users to evade the wizard (I tried it on a brand new account and yes, I could bring up the normal Ask Question mobile view). Even if we don't care about users getting around the wizard in that way, it's still a very uncomfortable change to be forced into the full site view to use the wizard, dropped back into the mobile view without warning, and have to manually re-enable the full site view to continue with the wizard if you so desire. The context of the section prompts are lost between the form and the final question. Or take it a big step further (maybe too big for the legacy of SO), and maintain these four pieces of content as separate attributes on a question throughout, for formatting, searching, etc. This is... not a good UX setting. Must fixxxxxx. The navigation needs an improvement. Every next button should lead somewhere where I also find a back button to return. Unfortunately, also the browser's back-button (or Alt←) doesn't work as expected and only restarts the whole wizard. Things like these quickly create frustration. When ever a back button on the target page is not possible (at least not in the current implementation), I suggest to change the next button on the origin page to something which makes it clear that this is a one-way path, e. g. by renaming it to leave wizard and launch editor or similar. 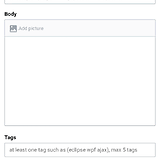 While selecting tags, the wizard is allowing me to type tags (seems like it is allowing the creation of new tags). It should not allow me to type random tags in this step, in the final step it blocks me from adding new tags. It tells me that it requires 1500 reputation to create new tags. 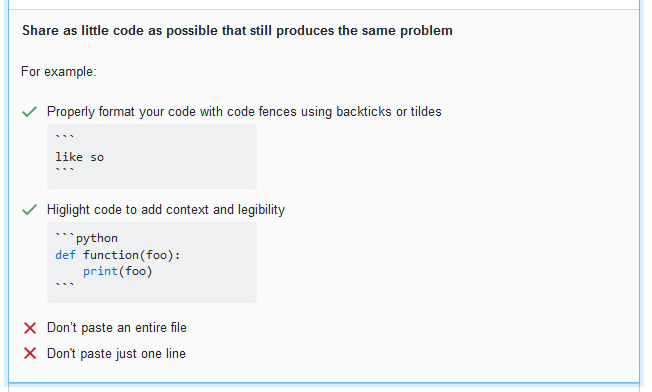 In the "Show some code" section, why not just automatically make that a code block instead of asking the user to provide the backticks? I guess you could put context e.g. ``` csharp. I think it would have been more user friendly if the wizard automatically did it. I find unhelpful that people that would ask off topic questions on this site (after not reading the little /help/on-topic page) would find being dropped into site.se/help with a tons of links and no clear path forward. Maybe we need a /help/landing-from-so on those sites with a very short introduction of the site topic (what questions should be asked and not be asked (depending on the site that redirected them there?)) and a pathway for searching for answers/asking their question. One of my most common gripes about questions asked by new(er) users is that the problem statement is something along the lines of "it doesn't work" or "it's not working" (e.g. this question). Is there any way the wizard can look for these commonly used phrases and provide a polite suggestion that perhaps the problem statement needs some work? Not the answer you're looking for? Browse other questions tagged discussion featured ask-question-wizard announcement . When to remove an IDE tag? How “mandatory” can we make the help wizard?